Too Many Cooks, Not Enough Fish. What's The Solution? : Krulwich Wonders... If we don't notice that animals are in deep decline, do we keep eating and eating until what is disappearing is gone permanently? Or do we unconsciously adjust? Too Many Cooks, Not Enough Fish. What's The Solution? Yes, there are more and more people on the planet, and yes, there are fewer and fewer fish in the sea, but do we really notice? After all, fish live in water and we live on land; so we don't mingle that much. If fish were sparrows, we might see a dramatic decline, but who misses what they don't see in the first place? Second, and this is the more subtle point, if animals are disappearing slowly, we are wired not to see the extent of the decline. People think "normal" or "natural" is what they saw when they were kids. If there were lots of bees in your neighborhood when you were 8 years old, that's the number of bees you expect to see when you're 68. If your grandma saw double that number 60 years earlier, her baseline is erased when she dies. Your experience becomes the new normal. When you die, "normal" resets and becomes whatever your daughter saw when she was 8. Meantime, almost without realizing it, the "normal" number of bees keeps getting lower and lower. That's why this graph of fish in the sea is so revealing. Based on a study by Dr. Villy Christensen and colleagues at the University of British Columbia, it shows population (biomass) changes of various fish in the Atlantic over several human generations — from 1900 to 2000. The fish here include bluefin tuna, cod, haddock, hake, halibut, herring, mackerel, pollock, salmon, sea trout, striped bass, sturgeon, turbot, the species traditionally favored by humans; they are also larger. As the two maps show, in 1900 these fish were found all along the African, European and British coasts. The North Sea (between Britain and Scandinavia) was thick with them; there was a mysterious (to me) patch in the mid-Atlantic, plus a thick clump from Florida to Labrador, then over to Greenland and across to Iceland. Then, just a hundred years, later — except for a little patch near Labrador — they're gone, or drastically diminished. This is, of course, a macro picture. These bigger, popular fish are mostly not extinct. There are just way, way fewer of them, and while this happens in a blink of an eye in our animation, from the human point of view, the decline took four human generations. Will We Eat Them Into Extinction? Maybe Not. Which makes me wonder: if we don't notice that animals are in deep decline, do we keep eating and eating until what is disappearing is gone...permanently? Or do we unconsciously adjust? Maybe, deep down, we sense that some foods are no longer plentiful so we make it the fashion to eat less of them? Do we reset our appetites from generation to generation? I ask, because I'm reading a history book, Mr. Hornaday's War by Stefan Bechtel, which describes a banquet that took place in 1886, when there were more fish in the water, more birds in the air, more varieties of game. Back then, every year the richest folks in America threw an annual dinner in Chicago. The meal was a tradition, held just before Thanksgiving. The 1886 banquet was served at the Tremont House, a posh hotel on the corner of Dearborn and Lake Streets. Former President Ulysses Grant was there, so were Mr. and Mrs. Marshall Field from the department store, Mr. and Mrs. George Pullman, owners of the railroad company, Gen. Philip Sheridan, Civil War hero, and the menu was published in the Chicago Tribune on Nov. 22. Every dish was listed so that ordinary folks could imagine being there. 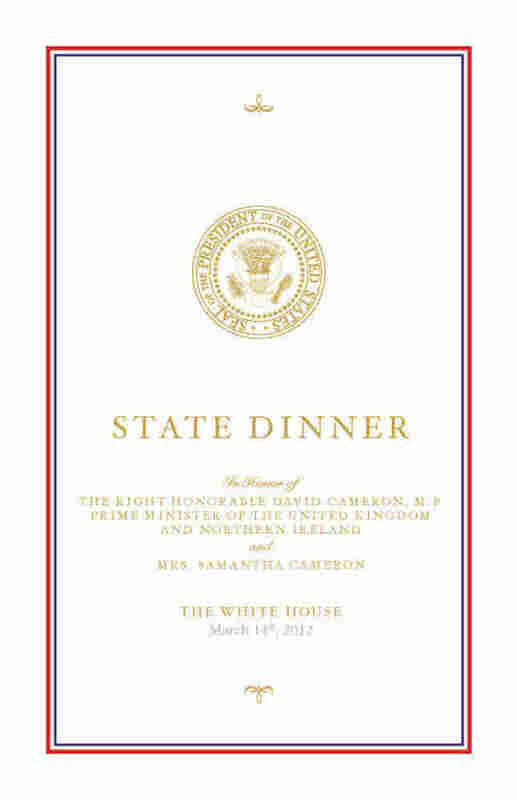 The not so subtle message: if you reach the top of the heap in America, this is what you get to eat. Anything, everything that can be boiled, roasted, garnished, can be yours. It's less a meal than a parade. I want to reprint the menu for you, or part of it anyway, which is labeled: "Procession of Game." Crisped Halibut with Potato Crust, served on a bed of baby kale fresh from the White House garden, shaved Brussels sprouts and micro cabbage sprouts. Compared to 1886, this is a trifle! Even the language ("baby" kale, "micro" cabbage, plucked from our own little garden in the back) suggests that at the pinnacle of power, today we watch our calories, keep it local, scale it down. Even the bison meat, I'm guessing, was served in thin slices. In 1886, we gorged. In 2012, we nibble. These very different dinners describe very different moods which, in turn, reflect very different worlds. Is a balance being struck here? Do we somehow know we can't afford to have it all, so that what was "fabulous" in 1886 has been reformulated to a more appropriate, more modest "fabulous" today? I'm not sure. If I offered you a plate of opossum, followed by a leg of elk, then wood duck, and a thick slice of cinnamon bear, how many of you would say "Bring it on!" And how many of you would say, "Let's just do the elk, thank you. And maybe bring me a doggie bag." Stefan Bechtel's book Mr. Hornaday's War: How a Peculiar Victorian Zookeeper Waged A Lonely Crusade for Wildlife That Changed The World tells the story of a pioneer of the conservation movement William T. Hornaday. I've wondered about Mr. Hornaday in an earlier blog post. For a vivid accounting of what's happening in our oceans, Professor Callum Roberts' book, The Unnatural History Of The Sea is excellent. The disappearing fish graphic was designed by David McCandless and can be found on his Information is Beautiful site. The data comes from this study. The image from Engelbert Humperdinck's "Hansel and Gretel" at the top of this post was taken by my sister Sara, who photographs for The New York Times. 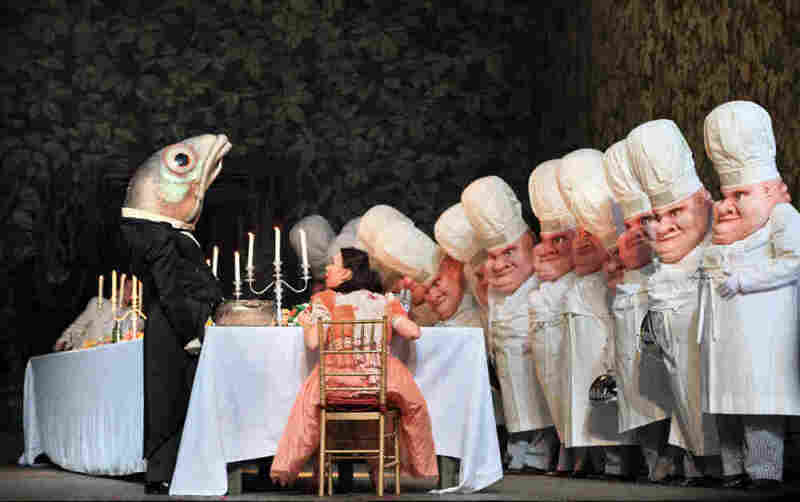 This is a scene from the Metropolitan Opera's 2011 production and it demonstrates (if I may be so bold) that my sister really, really knows what she's doing.